This weekend sees some interesting regattas on both sides of the pond. In the U.S., it’s the NCAA in Indianapolis and the IRA on Lake Mercer. 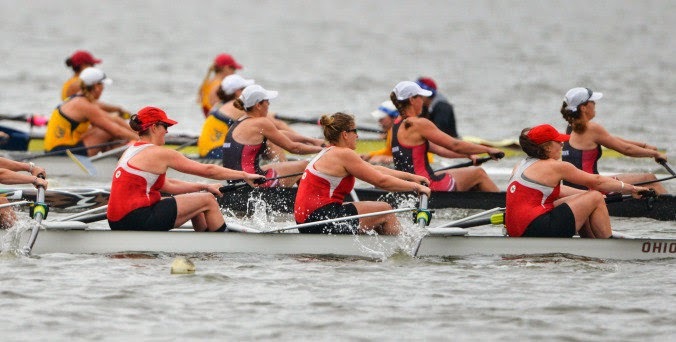 Bryan Kitch of RowingRelated has picked his ‘Crews to Watch’ at these championships in a well-written piece here, while you will find USRowing’s take on these two regattas here. Today is also when the National Rowing Foundation is inducting new members into the NRF’s Rowing Hall of Fame, which will happen at the Princeton Marriott at Forrestal. Read more here. In Europe, the European Championships are underway in Belgrade, Serbia, which you can read about here. This weekend it’s also the Scottish Championships and the Scottish Schools’ Championships at Strathclyde Country Park. You will get more info here. If you are interested in finding out how this year’s Nat Schools Regatta went in Nottingham, England, then read what British Rowing wrote about the regatta on their website, here. Norwegian sculler Olaf Tufte is back! The legendary sculler will race in the single sculls again, now at the European Championships in Belgrade, Serbia, which start today. Will he be able to rise to the challenge as the reigning World Champion Ondrej Synek of the Czech Republic has been king in this boat class for the last four years? Worldrowing.com has posted an article about whom to watch for at these championships. Read about the rowers on FISA’s new, spiffy website, which is much better than the previous one (we think). 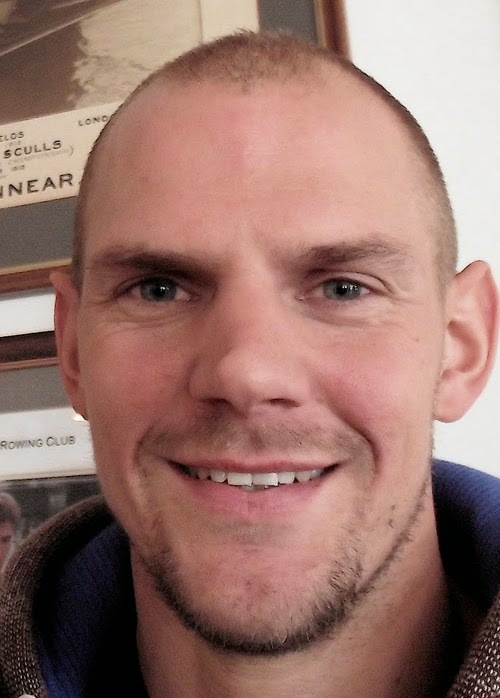 HTBS received an e-mail from Derek Gordon in Northern Ireland, who rowed at Trinity College Dublin and for Neptune Rowing Club in the 1970s and 1980s. After having read the post on 2 April about the statue ‘The Silver Man’, Derek was hoping that he would find an answer to a question he has. Derek writes: ‘I attach some pictures of a recent find bought on ebay. I have no information on its age or origins, though I think its from England. Perhaps your wider readership might have some idea. The silver plated figure is about 10 cm to the top of the oar and he stands on a plain wooden base.’ See the photograph above and the two photographs below. If anyone among the readers has an answer or information on Derek’s ‘man’, please leave a comment, or send an e-mail to HTBS editor, at gbuckhorn – at – gmail – dot – com and we will post the answer. Thank you! On the same matter as ‘The Silver Man’, right now our colleagues at Rowperfect have a question from a reader who has a similar rowing statue. Take a look here. Talk about Puffin at RRM - Not to be missed! Last year in September 2013, the River & Rowing Museum in Henley-on-Thames presented Graham Walters, who gave a thrilling talk on an incredible journey across the Atlantic in the fifteen-foot Puffin, successfully completing an ill-fated voyage that began 30 years earlier when the two-man crew, David Johnstone and John Hoare, disappeared after 106 days at sea in an attempt to row across the Atlantic. 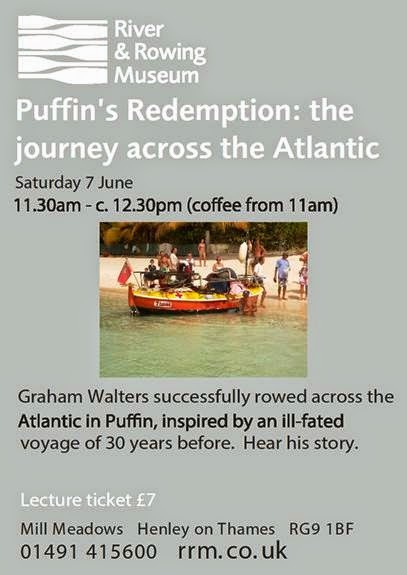 Due to popular demand, on Saturday 7 June, Walters will be back at the River & Rowing Museum in Henley to repeat his talk, which is called “Puffin’s Redemption: The Journey across the Atlantic”. The talk is between 11.30 a.m. and ca. 12.30 p.m. (coffee from 11 a.m.) and the ticket price is £7. Yes, you all know that the race between Oxford and Cambridge men is the oldest ‘Boat Race’ in the world, first rowed in 1829. 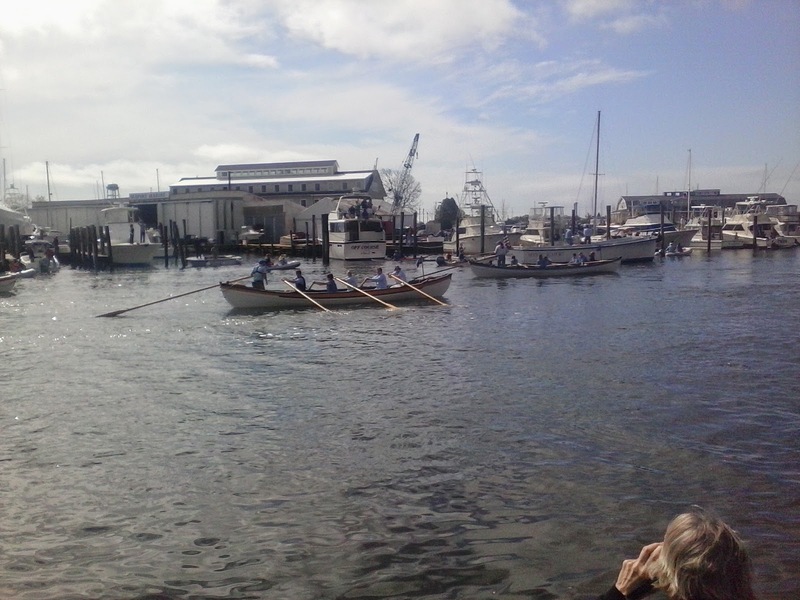 You are probably also aware that the second oldest student boat race is the one between the American universities Harvard and Yale, with its premier race in 1852. However, which boat race comes next? It is a little tricky, maybe…. It was rowed the first time in 1870. It is ……. Yes, well done, it is the Australian race between Melbourne and Sydney universities. Now, which student boat race is in fourth place (but pronounces itself as number 2 or 3)? Well, it is the Scottish boat race. The Scottish newspapers and both universities claim that the one between Edinburgh and Glasgow is either the second or third oldest, but being first rowed in 1877, the Australian race beats them by seven years. Well, anyway, last Saturday on 24 May, not one but six races were rowed on the River Clyde in Glasgow between Edinburgh and Glasgow. The main races between the women’s A crews and men’s A crews, and the two races between the reserve crews, women and men, were rowed from Broomielaw Quay to the grandstand finish at the Riverside Museum, a distance of 2.6 km, while the two other eights races, between the alumni crews, were rowed on a shorter distance, a 500-metre sprint. Hundreds of spectators, including Scottish Olympic gold medallist Katherine Grainger, who acted as starter, watched Edinburgh win five of the six races, Glasgow only taking the women’s A race. The final event of the day was off-water, ‘a novice erg challenge, where Edinburgh’s Calum Irvine, David Duffy, Jill Scott-Dodd and Kathryn Corrie took turns rowing 250-metre on the erg until they had won the 2k race with a time of 5:58’, Charles Thompson, sponsorship secretary, writes in an e-mail. About the regatta, Katherine Grainger said: ‘It’s been brilliant. It was pretty dominant by Edinburgh University this time round, which is a bit of a shame as it’s nice when it’s close racing all round, but it’s always a great event and it’s lovely to see so many people coming down to support it and cheer on the rowers’. 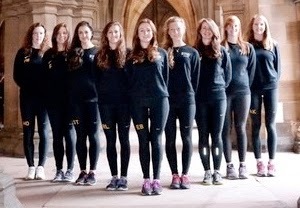 University of Glasgow: Bow Steph Tinney, 2 Heather Walker, 3 Zoe Wilson, 4 Alison Kells, 5 Hannah Duncan, 6 Claire Aitken, 7 Rebecca Lightfoot, Stroke Emma McDonald and Cox Emma Baxter. University of Edinburgh: Bow Kathryn Corrie, 2 Jill Scott-Dodd, 3 Lucy White, 4 Lydia Stuart-Kregor, 5 Beth Simmonds, 6 Claire Harland, 7 Maddie Arlett, Stroke Robyn Hart-Winks and Cox Louisa Skevington. University of Glasgow: Bow Luke Cerexhe, 2 Alasdair Lennie, 3 Duncan McCoy, 4 Jonny Cheyne, 5 Andrew Burchell, 6 Patrick Murray, 7 Julian Sprossmann, Stroke Leo Glass and Cox Rhona Findlay. University of Edinburg: Bow Tom Claxton,2 Kieran Brown, 3 James Stirling, 4 Rufus Scholefield, 5 Rob Hall, 6 Graham Ord, 7 Henry Millar, Stroke Colin Barrett and Cox Eleanor Hall. Read more about the races and the crews on the universities’ websites: Edinburgh and Glasgow. This article was corrected and updated on 27 May, at 12:00.
to give name to things. as he dipped his oars in the river. A record 36 nations will take part in the 2014 European Rowing Championships in Belgrade, Serbia with 659 competitors entered to race. This large number of entries has been aided by the European Championships being changed to an early-season date in the calendar rather than its previous position at the very end of the rowing season. Last year May was tested and it proved to be popular. Three countries – Germany, Italy and the Netherlands – are sending a full 17-boat team with Great Britain sending 16 crews followed by Russia and the Czech Republic each with 15 crews. Germany topped the medals table in 2013 scoring nine medals. Italy followed in second and the Czech Republic was third. Germany will face stiff competition from Great Britain this year with the British sending a much more complete team than in previous years. One of the most anticipated races will be the men’s eight with the German Olympic Champions facing the British World Champions. This is the first time for these two crews have faced each other since last yea’'s World Rowing Championships in Chungju (KOR). This regatta will mark the return of single sculling legend Olaf Tufte of Norway. The two-time Olympic Champion in the men’s single sculls took a break from racing after finishing ninth at the London 2012 Olympic Games. Tufte will have a tough challenge when he comes up against World Champion Ondrej Synek of the Czech Republic and 2013 World Championship bronze medallist Marcel Hacker of Germany. Laura Milani and Elisabetta Sancassani of Italy are favourites in the lightweight women’s double sculls as they come to this regatta as defending World Champions. Olympic Champion in the double, Katherine Copeland of Great Britain has returned to racing and is making her post-London debut with Imogen Walsh. Together they are likely to challenge the Italians. The European Rowing Championships was reinstated in 2007 and is open to the 43 European national rowing federations, including Israel. There are 17 boat classes (14 Olympic events plus three International events). The 2014 European Rowing Championships goes from 30 May to 1 June 2014. Full entries, provisional timetable, race reports, live results, live blogging, live race tracker and a photo gallery will be available on www.worldrowing.com throughout the regatta. 1910: The third of six consecutive Harvard victories over Yale. Here is Part 2 of Tim Koch’s article on William Averell Harriman. Part 1 was posted yesterday. Arriving at Oxford ...Averell found his way to the boathouse where he waited outside an open door in the rain while a boatman went up to the dressing room to fetch the Oxford (President). In his own good time that gentleman came down dressed in a great white duffle coat, stood in the rain with Harriman, read and then quizzically reread the letter of introduction. Governor Harriman recalls its key sentence: “Harriman has come from Yale, which is 3,000 miles away, to see you row.” The (President) crumpled the letter into a ball, stuffed it in his pocket and said, “We’ll be going down the river shortly. If you walk along the towpath, you will be able to see us.” He left Harriman standing in the rain. Possibly this chilly reception was due to the suspicion that an American was unlikely to be an amateur as defined in the strict and peculiar rules of Britain’s Amateur Rowing Association, especially as regards its opposition to professional coaching. Also, the Brits may have sensed that he was ‘new money’ and may have been unsure if he really was ‘a gentleman’. Whatever the reason, Harriman was left alone on the Isis towpath to observe Oxford’s preparations for the 1912 Boat Race. The American visitor was still largely ignored when he followed the crew to Henley-on-Thames where they had further coaching under W. F. C. Holland. Daily he followed the crew, observing from horseback, but when they all dined at Leander in the evening, he sat alone. Eventually the Dark Blues must have realised just how serious Harriman was and, perhaps a little flattered by his attention, President Bourne invited him to eat with them. After training at Henley, the crew moved to Putney for a final period of instruction before the Boat Race on 30 March, now with Harcourt Gilbey Gold as finishing coach. Harriman’s leave of absence from Yale was running out but he was tempted to stay on in England to see the race against Cambridge. Thus he booked his passage back to the United States on two ships, one leaving before and one after the event. Eventually, he decided that he would have to miss the race and he took the earlier sailing. He cancelled the later booking, one that was to have been on the maiden voyage of a new liner – RMS Titanic. 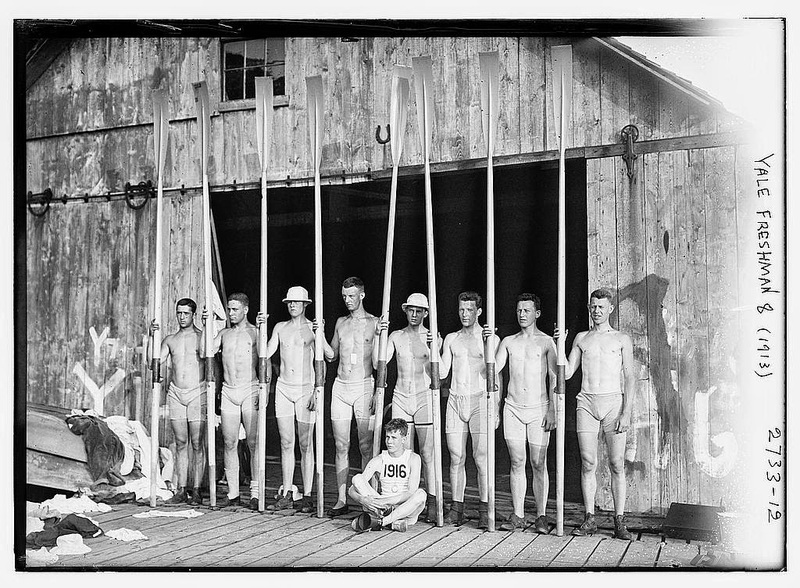 Yale Freshmen Eight, 1913. Picture: Library of Congress. On his return Harriman had less than three months to teach his Freshmen the new style in time for their race against Harvard at New London on 21 June. On the day, Yale lost this and every other race in the 1912 regatta. However, the Freshmen’s losing margin at two and a half seconds was the University’s smallest and they regularly beat their own Varsity crew in training. As a result of this, Harriman was eventually made head coach for 1913. In January 1913, Harriman went back to Oxford to learn more of the English Style, this time taking with him Jim Rodgers (his predecessor as head coach who now had become his advisory coach) and Bud Snowden (the Yale Captain). 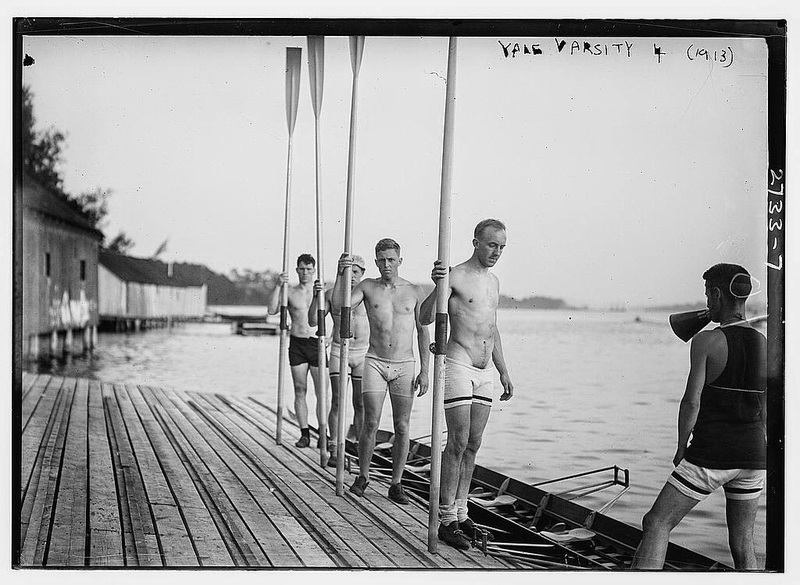 Yale Varsity Four, 1913. Harriman should have got them bigger shorts. Picture: Library of Congress. By 14 April the Washington Herald headlined “Yale Oarsmen Hard At Work – Harriman Employs Methods Which He Learned While Watching Oxford – Awaits English Coaches”. 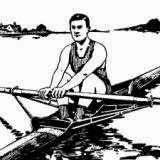 The British finishing coaches were Alister Kirby (who rowed for Oxford in the Boat Races of 1906 to 1909 and was in the winning eight at the 1912 Stockholm Olympics) and Harcourt Gilbey Gold (who stroked three successive wins for both Eton at Henley and Oxford in the Boat Race). Gold also brought his brother-in-law, Gilchrist Maclagan, (who coxed four University Boat Races, six Henley Grand wins and the winning eight at the Stockholm Olympics). He was to instruct the cox in use of the new English built and ‘English rigged’ boat. The Herald article indicated of how far the Varsity coach would defer: Until the two English coaches arrive it is doubtful if Harriman will attempt to select even a tentative first eight. Unfortunately, things were left very late. The race against Harvard was to be on 20 June, Kirby arrived on 10 May and Gold, Maclagan and the new boat were only available from 3 June. Kirby’s first view of the American crews was at the Yale Spring Regatta on 12 May and the results of this were a selector’s nightmare. The Second Varsity defeated the Varsity by two lengths, the Sophomores (2nd Years) defeated the Juniors (3rd Years) and the Second Freshmen were defeated by a high school crew. Not surprisingly perhaps, Harvard won every race at New London in 1913. The Yale Varsity crew were in the lead at two miles but lost by 38 seconds at the finish. Crossing the line they were rating 29, compared to Harvard’s 38. Spectators at the Harvard - Yale Regatta. 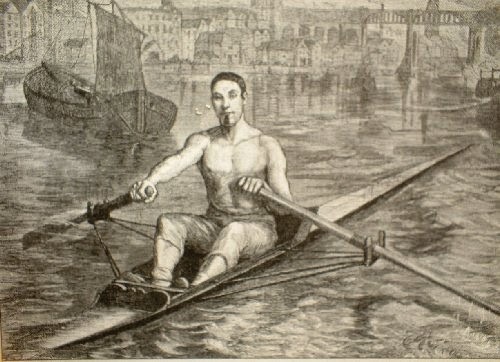 When the present English system of rowing was first adopted at Yale, it was felt that the success or failure of the undertaking could not be determined in a year’s time, but most of the followers of the scheme had agreed that the race with Princeton on October 25 would go far towards showing whether or not the system warranted a continuation. The Yale crew came across the finish line a length behind Princeton after a two-mile race, which was characterized for Yale as splashing, unfinished and arrhythmical, the eight men being utterly exhausted. This seems to have decided the matter in the eyes of the graduate and undergraduate bodies, the general consensus of opinion being that unless Yale wishes to have her crew suffer continual defeat, a professional coach of the first rank must be obtained and a new system of rowing installed. Guy Nickalls, the famous Leander Rowing Club coach of London and Eugene J. Giannini, coach for years of the New York Athletic Club crews, have been asked to assist.... The whole question of a change in crew policy came about after the defeat by Princeton.... After this race W. Averell Harriman practically eliminated himself from the situation and left the way for a new coach and a new policy..... Nickalls is quoted as saying that there is no such thing as the English stroke or a Chinese stroke, speaking broadly, and that the stroke used by the English college crews is not in all points suitable for use by American college crews. ..... Coach Courtney came out in strong praise of the English system. He said that Yale might have had some success of it if she had someone who knew how to teach it. Without mentioning any names Courtney left the impression that young Averell Harriman was not the best man in the world to teach Yale the English stroke. 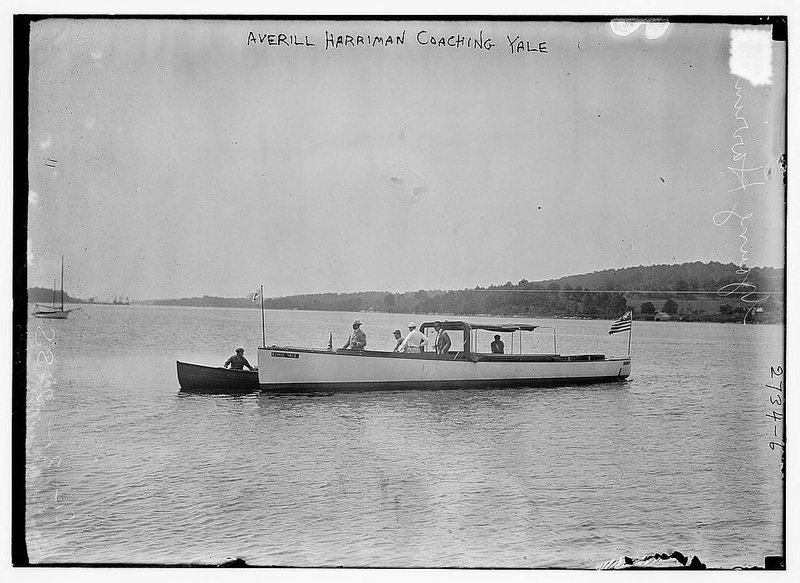 Harriman and others in the Yale coaching launch, 1913. Picture: Library of Congress. ...with his air of stoic detachment, Harriman seemed aloof even to students of his own age. He had been taught to row by a private tutor on his family’s own private lake, and the other boys came to regard him as more of a coach than a schoolmate as he helped to organise the underclass crews. He was tough physically and mentally, and relished putting his abilities on the line. Recreations were challenges to be mastered, and Harriman inevitably did: polo, rowing, skiing, bowling, croquet...... ‘He went into any game lock, stock, and barrel’, Robert Lovett later recalled. ‘He would get whatever he needed – the best horses, coaches, equipment....... and worked like the Devil to win'. Most importantly perhaps, there was the influence on Harriman of his father, who was loving in a strict, stern way, but was fiercely determined that each of his children should ‘be something and somebody’. Maury Klein, a biographer of Harriman Senior, holds that: ‘(E. H.) Harriman prodded [his] children into reaching beyond what they thought themselves capable of doing’. Here, I would suggest, is ‘the nub’. Harriman worked as hard as he possibly could have done to understand and communicate ‘the English Style’ in the very short time that he had available. But money and effort and will cannot speed the acquisition of the one thing that practically every coach needs – experience. * Even if he had decided not to change Yale’s rowing style, it is doubtful that such a novice coach would have achieved much better results. When he did bring in men of experience to coach, they did not have enough time to be effective. The new regime under Nickalls had both time and experience and Yale Varsity won by inches in 1914 and by 21 seconds in 1915. While it would be churlish not to give Harriman some of the credit for these successes, how much is for history to speculate. Alert and active to the end, William Averell Harriman died in New York on 26 July 1986, aged 94. In a tribute, former Secretary of State Dean Rusk said: ‘One cannot grieve after a life so long and so nobly led’. * Before someone with a knowledge of Yale Rowing corrects me, I will have to acknowledge ‘the exception that proves the rule’. 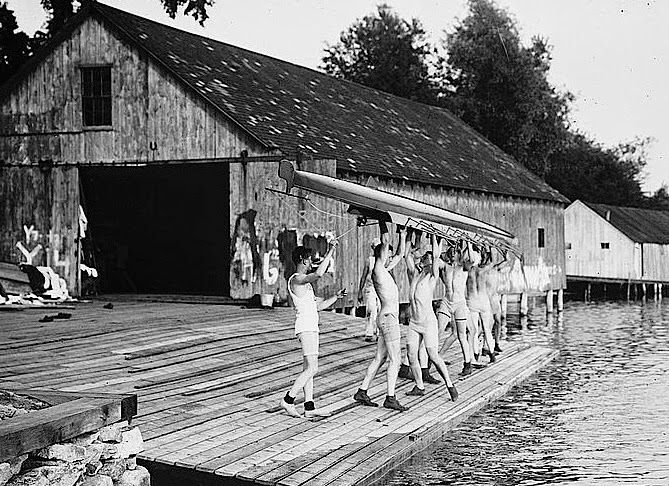 In 1870, Yale Semaphore Bob Cook studied ‘orthodox’ rowing in England and is credited with bringing it to the United States and adapting it to American rigs to become ‘The Bob Cook Stroke’ which was widely used by U.S. college crews. Yale Varsity Eight, 1913. Picture: Library of Congress. The head coach that Yale appointed in December 1912 seemed an odd choice to many people. He was a Junior (3rd Year) who had only rowed for the University as a Freshman (1st Year) and he was the socialite son of one of the richest men in the United States. It was a bold move made largely out of desperation. Yale had not won the annual regatta against Harvard, the oldest intercollegiate contest in the United States, since 1907. Bob Cook, who coached Yale from 1872 to 1899, supported the appointment, saying that the young man in question was ‘easily the most promising crew coach in America..... I hope that he can give his life to it.’ As things turned out, the new coach did not make rowing his lifetime's commitment. However, the two years that he did give to coaching were remarkable for their efforts. Further, after he left Yale and rowing behind, his life and work from the First World War to the final days of the Cold War had a great and lasting effect on the United States and on the world. His strong-minded father impressed on him the virtues of a healthy body, strong nerves, an ability to mix with others and public service. ''Great wealth is an obligation,'' his father declared. William Averell Harriman, 1913. Dubbed by the press as ‘the millionaire coach’. Picture: Library of Congress. Harriman Junior was an undistinguished student academically at his prep school, Groton, Massachusetts, and later at Yale (he probably would not get into an Ivy League University today). However, he did excel at sport – including rowing and sculling. Typically, in the summer of 1908 his father hired the best sculling coach that he could find to tutor his two sons on the private lake of his 20,000-acre estate at Arden, N.Y. He chose James A. 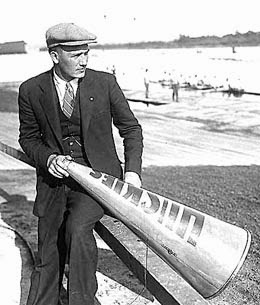 Ten Eyck whose Syracuse eight had just defeated a much fancied Cornell crew at the Intercollegiate Rowing Association Regatta. 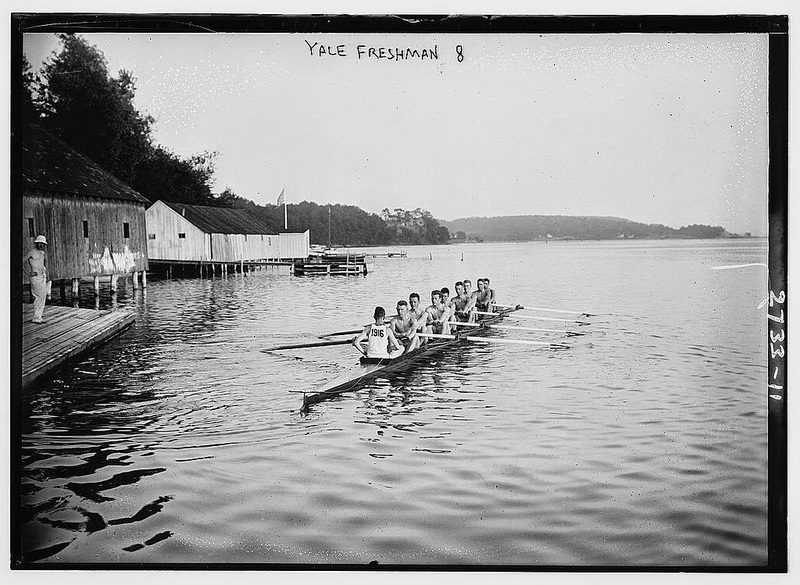 In September 1909, Harriman went up to Yale and made the Freshman Crew. He had ‘a polished style’ but his weight of only 160 pounds/72.5 kg went against him and in his Sophomore (second) year he took up double sculling. His coaching career spanned his Junior (third) and Senior (fourth) years and I will return to this after a brief summary – as far as that is possible – of the remarkable life that W. Averell Harriman led after Yale. Harriman at Groton School, fifth from the left. While still at Yale, Harriman joined the Board of the Union Pacific Railway, having gained some practical experience of the business by working as a track repair man in his holidays. In 1917, keen to show that he was not just ‘the boss’s son’, he left Union Pacific and bought a rundown shipyard. In less than ten years he was the most powerful man in American shipping. Having thus proved ‘that a man can rise from greatness’, in 1926, he sold his ships and returned to Union Pacific as Chairman. In 1920, he had also established the private bank of Harriman Brothers and undertook as series of innovative international investments including making a mining deal with Leon Trotsky and the new Soviet Russian State. Though not all of his business ventures were profitable, Harriman’s successes were notable – as when he made huge profits for Union Pacific during the Great Depression when many other railroads went bankrupt. Until 1934 Harriman was a businessman, not a direct political player. However, he perceived that with the coming of ‘The New Deal’ (a series of interventionist government programmes made in response to the Great Depression), power was shifting from Wall Street to Washington. Democrat President Roosevelt (‘FDR’) made the ‘reformed Republican’ chief of the National Recovery Administration, an agency established to set prices and establish ‘fair practice’. In 1941, while America was still technically neutral, FDR put him in charge of Lend-Lease Aid to Britain. His brief was ‘to keep the British Isles afloat’ by supplying food and materials from the U.S. and this he did using all his considerable skill. The UK, standing alone against the Nazis, had three weeks supply of food left and desperately needed a friend like Harriman. Fêted by his hosts, he enjoyed an intimate relationship with Churchill and his Government (though not as intimate as the one he enjoyed with Winston’s young and newly married daughter-in-law, the ‘colourful’ Pamela Churchill). Harriman (second from right) meeting the first American food ship to arrive under lend-lease to Britain. While this is clearly a posed publicity shot, the sending of fresh eggs across the Atlantic seems a little eccentric. 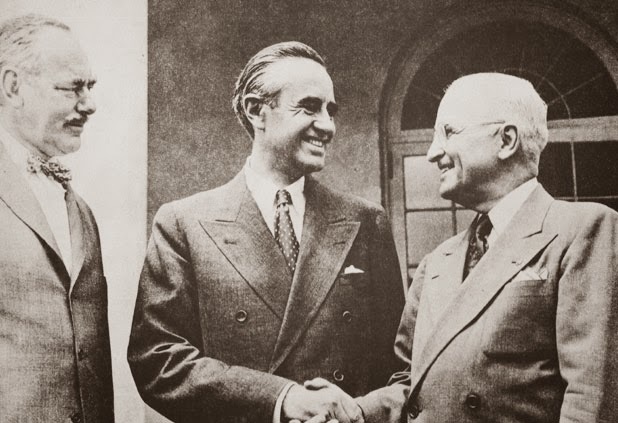 During the war Harriman’s diplomatic skills became increasingly recognised and he was a key participant at all of the major wartime summit meetings. His role was crucial as he was able to interpret Stalin to both Roosevelt and Churchill and he also smoothed relations between the latter two leaders. Yalta, 1945. 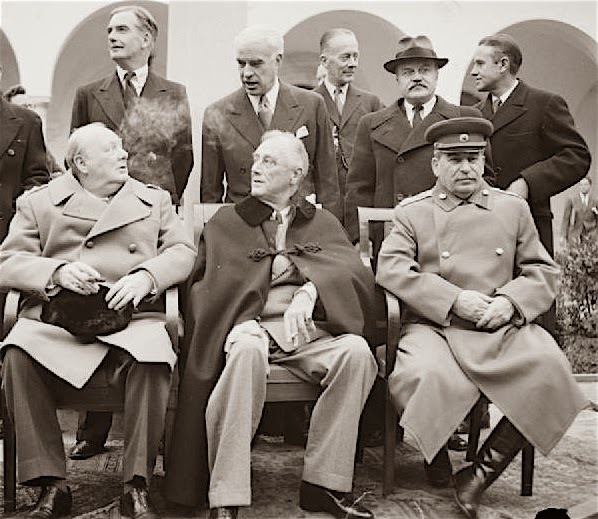 Churchill, Roosevelt and Stalin seated, Harriman standing, back right. With previous experience of dealing with the Soviet Union, Harriman was an obvious choice as U.S. Ambassador to the USSR from 1943 to 1946. He shocked many with his bluntness towards Stalin but this may have produced some sort of respect from the Soviet leader who made him a gift of a white stallion. Never an ideologue with the Soviets, he found Stalin ‘ruthless and brutal..... but basically dependable’ and also ‘better informed than Roosevelt and more realistic than Churchill’. He claimed that his most notable achievement as Ambassador was rejecting the USSR’s demand for a Soviet occupation zone in Japan, typically something he did without consulting Washington. 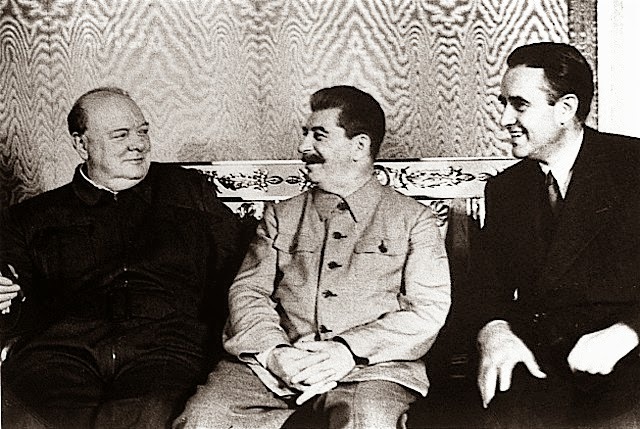 1942: Churchill, Stalin, Harriman. Stalin always won the staring contests. After the War Harriman was briefly Ambassador to Britain but was soon appointed President Truman’s Secretary of Commerce. He was concerned that, with the arrival of peace, most Americans only wanted ‘to drink Coke and go to the movies’. He felt that the United States should take an interventionist role in ‘defending freedom’ around the world. Motivated by noblesse oblige, Harriman and other patricians paid little heed to the instinctively isolationist American public opinion. He and fellow Yale Crew alumnus Dean Acheson were the leading members of the group of six friends who later became known as ‘The Wise Men’. Truman had few ideas on foreign policy and allowed the six to develop the policy of ‘containment’ in dealing with the Communist bloc. To this end Harriman was one of the founders of NATO, the collective defence agreement, and he became an architect of the Marshall Plan, the initiative to aid the rebuilding of Europe in a bid to stop the spread of Communism. In post-war American domestic politics Harriman, standing as ‘an uncompromising New Deal-Fair Deal candidate’, was an unsuccessful in obtaining the Democratic nomination for President in 1952 and in 1956. His only elected office was as Governor of New York State between 1954 and 1958. Despite (or perhaps because of) his liberal reforms in those four years (foreshadowing Kennedy’s New Frontier and Johnson’s Great Society) he was defeated after one term by one of the few men richer than he was – Nelson Rockefeller. 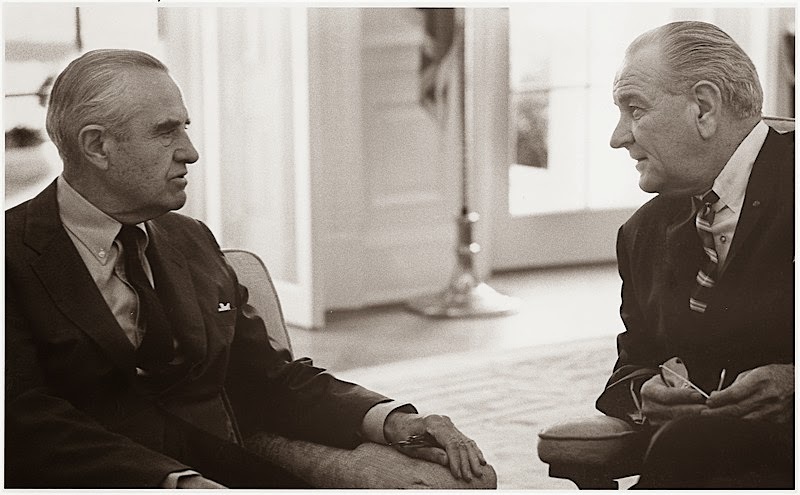 In 1960, President-elect Kennedy (‘JFK’) gave Harriman a very free hand and appointed him ‘ambassador-at-large’, to operate ‘with the full confidence of the president and an intimate knowledge of all aspects of United States policy’. He effectively served in this role not only for JFK but also for his successor as President, Lyndon Johnson. In 1963, he negotiated the Nuclear Test Ban Treaty with the Soviets that put an end to the superpowers’ testing of atomic weapons in the atmosphere. He spent most of the decade focused on Vietnam and for a time he supported the war in South East Asia. In 1968, he became the chief U.S. negotiator at the Paris peace talks, but after the election of Republican President Richard Nixon Harriman was, to his frustration, replaced. 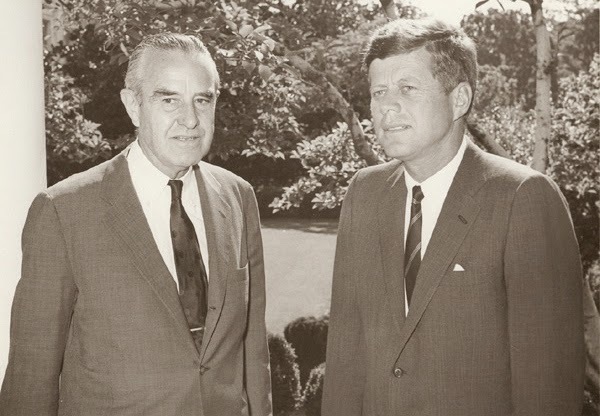 1960: Harriman with President Kennedy. The 71-year-old was initially sidelined at the youthful Kennedy White House, but the new President soon found that there was no replacement for him. Edward Kennedy later said: ‘when my brother Jack first became President, he announced that the torch had been passed to a new generation of Americans. Then he turned around and realized that Averell Harriman still had it'. 1963: Harriman with Khruschev at the Test Ban Treaty talks. In the 1970s, Harriman became a leading spokesman for detente as well as assuming the role of the Grand Old Man of the Democratic Party. In 1976, President Carter recruited him to rally public support for the Administration’s ultimately successful battle to secure ratification of the Panama Canal treaties. His final diplomatic mission was in 1982 during the Reagan Administration when, at the age of 92, he went to Moscow to meet with Soviet Leader Andropov. Possibly the 71-year-old Reagan like having a man around who was actually older than himself, even if it was someone who was, in the words of Presidential chronicler T.H. White, ‘the last tall timber of the New Deal’. 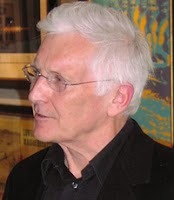 Two years ago, Christopher Dodd, rowing writer and historian at the River & Rowing Museum in Henley-on-Thames, published his Pieces of Eight: Bob Janousek and his Olympians about the coach from Prague who ‘saved’ British rowing, which had hit rock bottom at the end of the 1960s. 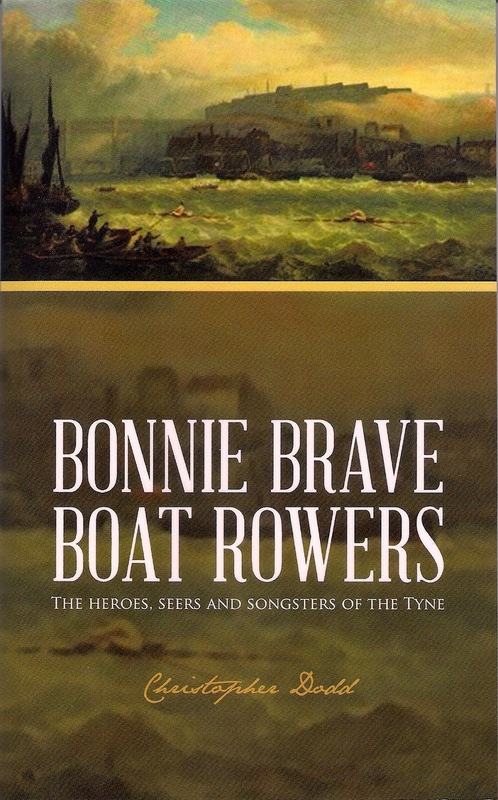 While Pieces of Eight is a 224-page book about amateur oarsmen going to the World Championships and the Olympic Games, Dodd’s most recently published book, Bonnie Brave Boat Rowers, is a thin 97-page book about, as the sub-title reads, ‘The Heroes, Seers and Songsters of the Tyne’. So not only has the author swapped rivers, so to say, instead of amateur rowers, in his new book, he is telling stories about England’s professional oarsmen and the boat builders of the Tyne during the 1800s and the beginning of the 1900s – indeed, a far cry from any Olympic Games in modern time. By now, there is a fairly good amount of published books about the most famous professionals who started to ply their oars and sculls on the Tyne before they travelled the world for world titles and high wages, especially the latter. Of course, Harry Clasper and James Renforth are mentioned in the book, but in the first chapter Dodd writes about Jack Hopper of Hexham, a nowadays forgotten professional sculler (unless you remember Dodd’s article about him in the Regatta magazine of December 1987; which, as a matter of fact, I do). Hopper, alias Smith of Scotswood, entered as a 20-year-old in the 1922 Newcastle Christmas Handicap with his eyes on the £100 prize money, quite a nice sum for a working lad at this time. He entered under both his real and false names to confuse the organisers and the other contenders. Though, this would be his first Christmas Handicap, Hopper was the fastest mover in any of the bookmakers’ books. He reached the semi-final, but there he was found guilty of a foul. He was also unlucky in the other Christmas Handicap races he entered, in 1923, 1924, 1927 and 1933. He never won any of these races, though he did reach the final in 1933 when he raced against Bert Barry of Putney, who, earlier in December that year, had beaten the Australian Major Goodsell for the world title. Hopper got a 15 second handicap, which would be impossible even for Barry to catch up. However, Hopper ran into the Redheugh Bridge – it seems his ‘flagger’ had lost him in the fog – so the world champion finished the race alone and claimed the prize money. Soon thereafter the handicap ‘fizzled out’. In the second chapter, before Christopher Dodd (on the right) embarks on telling the story of the famous boat builders on the Tyne, most of whom had been, or still were, professional rowers when they were crafting their boats and shells, he beautifully writes about the Tyne, Newcastle, its industries and the bridges in the city in a short account. When he gets to the boat builders, it is Matthew Taylor who starts the list. Taylor, a ship carpenter, who was hired by Royal Chester Rowing Club for £2:5s a week as a trainer in 1854, built an outrigger fixed-seat four, the Victoria, which had a smooth bottom, a boat with which the club took Stewards’ Challenge Cup at Henley in 1855. Taylor is credited for introducing the keel-less boat (that is with the keel inboard). However, it is not certain that Taylor was the first one to build a keel-less boat, Dodd writes. J. 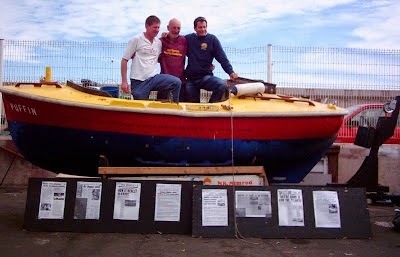 B. Littledale, Royal Chester’s captain, stroke and benefactor, has also been claimed for the design, and so has Harry Clasper, whose son, Jake Clasper (a boat builder in his on right), once wrote that he coxed his father and his crew in a smooth-bottom boat at the Thames Regatta in 1849. Boat builder Robert Jewitt had a dispute with Clasper in a newspaper saying that he was the one, who in 1843, built a boat with the keel inboard. It is clear that we will never know who the first keel-less boat builder was. The Victoria – now at the River & Rowing Museum – is not the only boat mentioned in this chapter. Other famous ones, St Agne’s, The Five Brothers and Lord Ravensworth, to mention a few, are also to be found in this chapter. Another boat building company that is brought up is Swaddle and Winship, which built some famous eights for Oxford and Cambridge in the 1870s. Whay’s myed ye bring such fearful news? Such sudden grief to bide. It is always such a delight to pick up a book by Christopher Dodd, who is a master of telling stories. No one can spin a yarn of a rowing tale as well as he can. Not only is this little book incredibly well-written, some passages are even beautifully written. Congratulations and well done, Chris! Do yourself a favour now, drop what you have in your hands, and order a copy of this book immediately – unless, you can wait till you are in Henley-on-Thames next time, which better be soon. Bonnie Brave Boat Rowers is published by AuthorHouse: eBook: ISBN 9781491895535. Softback: ISBN 9781491895528.
eBook or Softback available from www.bonnierowers.com ; www.bookstore-authorhouse.com and all good book stores on the web. Softback copies are also available from these shops in Henley: River & Rowing Museum, Richard Way Book Shop, Bell Bookshop, Leander Club, and Henley Royal Regatta, and all other good book shops. This review was updated on 21 May, at 4:30 p.m., as I, in the first version, wrongly made Major Goodsell an American. He was an Australian, of course, which was kindly pointed out by Tom Weil ~ thanks. Dear readers of HTBS ~ It is with great delight I write that ‘Hear The Boat Sing’ earlier this morning received the wonderful news that it has been chosen as the ‘Rowing History Blog of 2013’ by our nice colleagues at Rowperfect.co.uk. 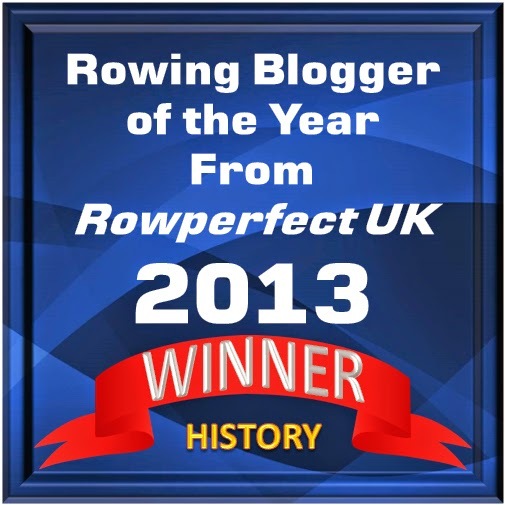 HTBS was nominated in this category together with Peter Mallory’s brilliant Rowing Evolution. Please read more on Rowperfect’s website here. On behalf of the whole HTBS Team: Thank you Rowperfect and thank you to all of you who votes for HTBS. And our warmest congratulations to all the other winners! To follow up on Saturday's post about the Charles W. Morgan's 38th Voyage, here is a video film from The Day, the local newspaper in New London, where the Morgan is now, and will be for a month to load the ballast, get re-fitted and train the crew. Do not miss to follow the vessel during the summer and get updates via Mystic Seaport's website, here. rhythmically, the window of his truck. 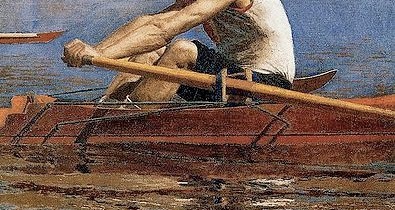 to sleep, row him to dream. he could return to the river, the river. A 'Lucky Ship'* leaving Mystic for her 38th Voyage. 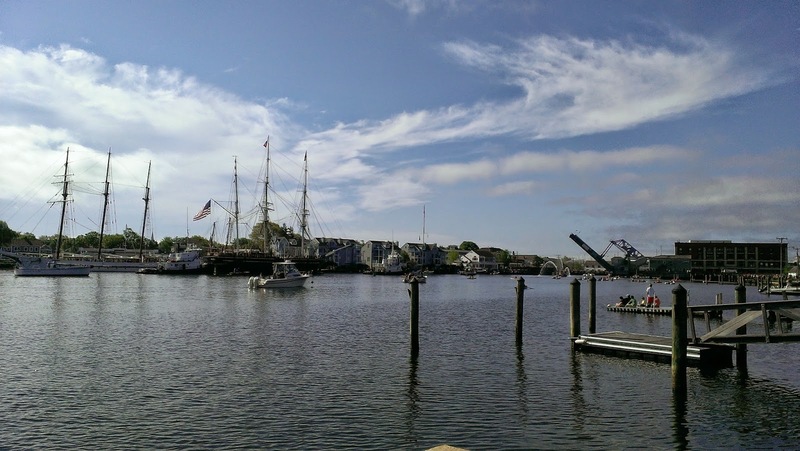 Today is a special day in Mystic, Connecticut, well, it is actually a very significant day in American maritime history, if not in the whole maritime world. 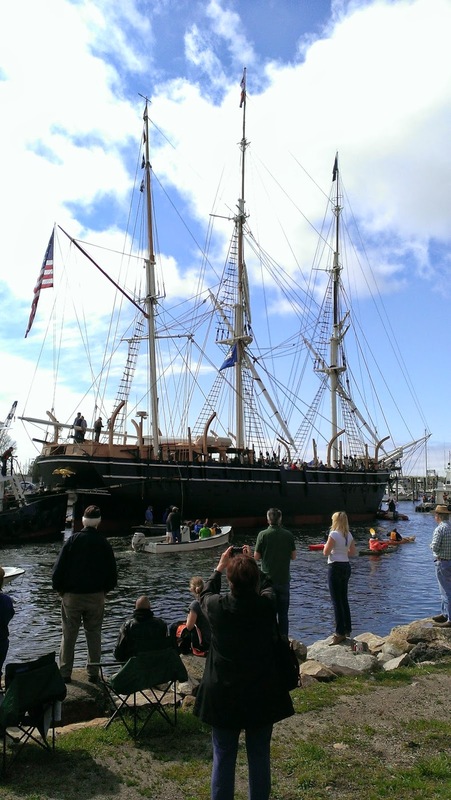 This morning, at 9:15 a.m., the last remaining wooden whaleship in the world, the Charles W. Morgan, embarked on her 38th Voyage. She arrived to Mystic Seaport - The Museum of America and the Sea in November 1941, looking ragged and crippled after having been beaten up at Col. Green's estate Round Hill, Massachusetts, by the 1938 Hurricane. The good people in New Bedford, where she was built in 1941, tried to raise funds to save her, but failed. Then Mystic Seaport - at this time called the Marine Historical Association - stepped in, and in November 1941, she was towed south to Mystic. 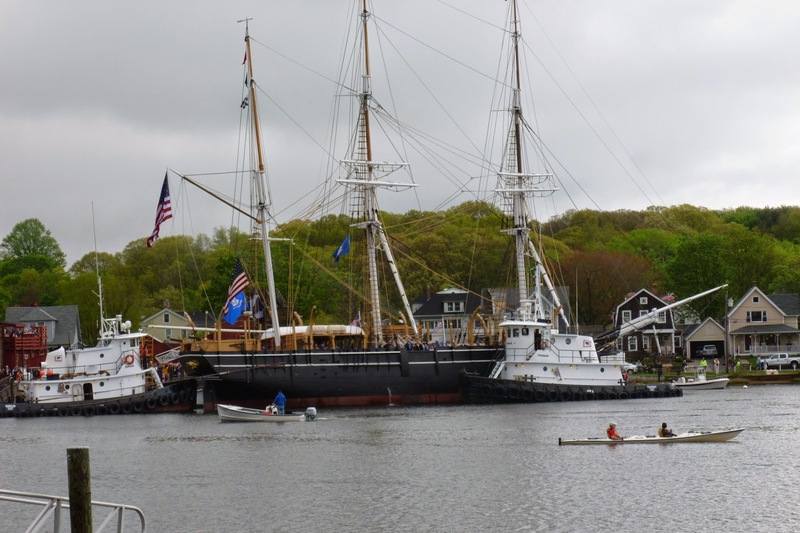 The Morgan has gone through several restorations since she arrived to Mystic Seaport, but none as severe and important as the one which started in November 2008. Now, more than five years later, after a multi-million dollar restoration, this morning she left the Museum to be towed to New London, where will be re-fitted. 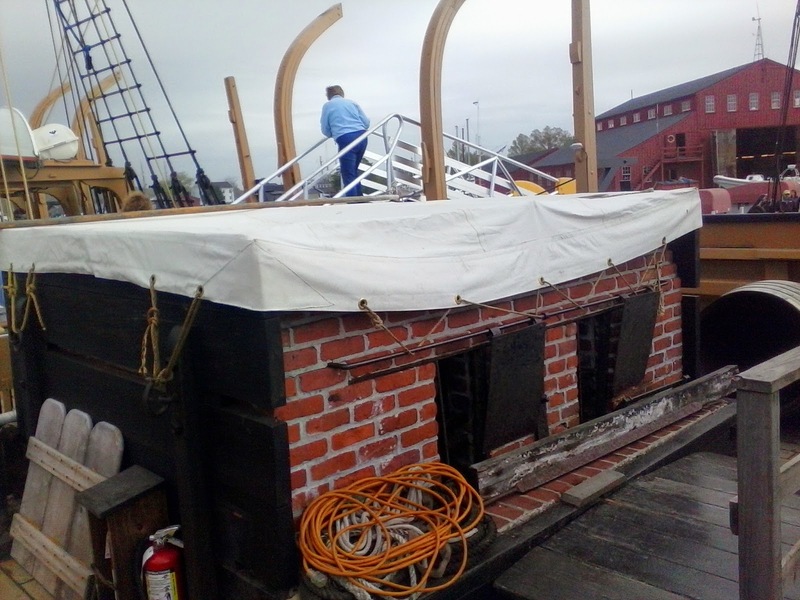 Her crew will be trained to sail there on day sails - remember no living soul has sailed a vessel like her, not even her experienced captain, 'Kip' Files of Rockland, Maine - before she embarks on her summer-long voyage to visit different ports along New England. Among the ports are Newport, New Bedford, Martha's Vineyard, and Boston, at the latter port, the Morgan will be docked by another famous vessel, the USS Constitution. For days the weather forecast looked dreadful for this morning, pouring rain, strong winds, and unruly sea. But the rain stopped early, and in time for her departure, the sun had come out, the dark clouds had moved away, and it was just beautiful - just look at those pictures for this entry. 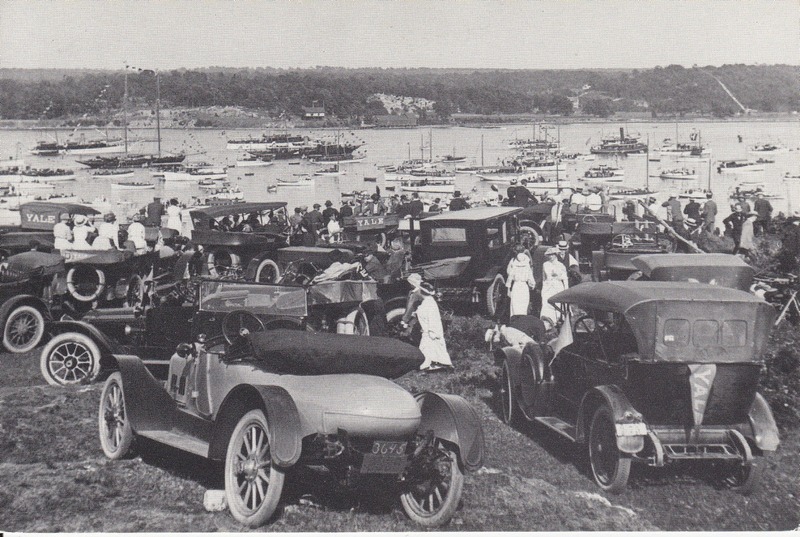 Thousands and thousands of people had gathered along the Mystic River to see the 'old girl' off. Following her was a flotilla of vessels, both from the Museum and private boats. Among them were five of the newly built whale boats that have been built for her voyage. 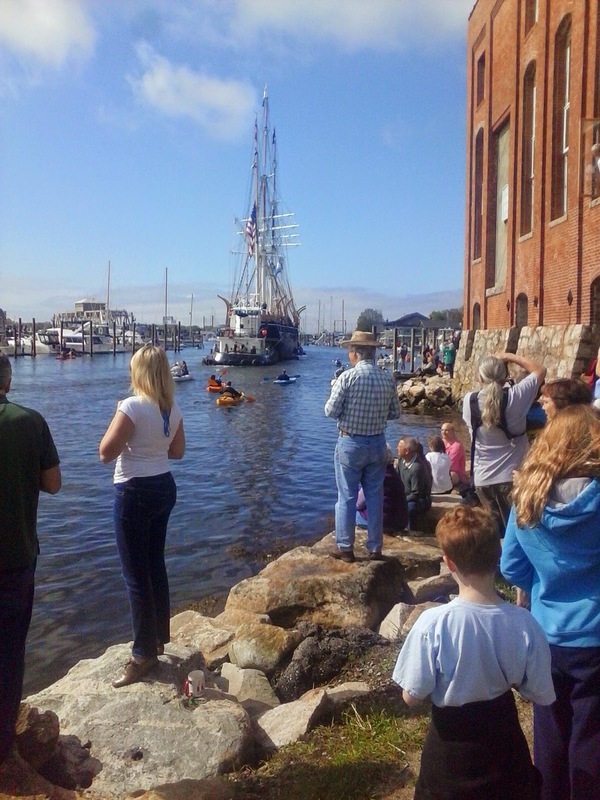 Get more information about the Charles W. Morgan's 38th Voyage from Mystic Seaport's website here. Here are some photographs from yesterday morning preparations for the voyage and from her departure this morning. 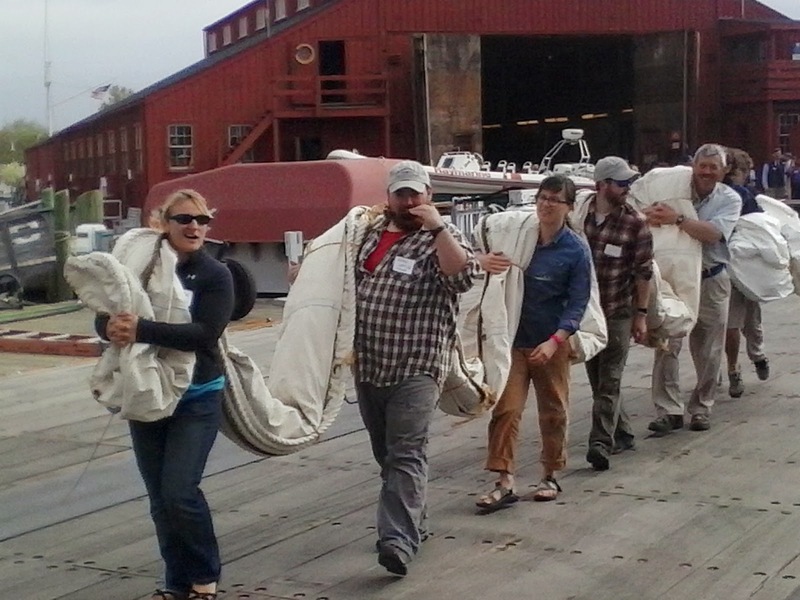 The crew carrying aboard the Morgan's new sails, made by sail maker Nat Wilson in East Boothbay, Maine. The tryworks, the oven where the whale blubber was boiled into oil, is still on board the Morgan. 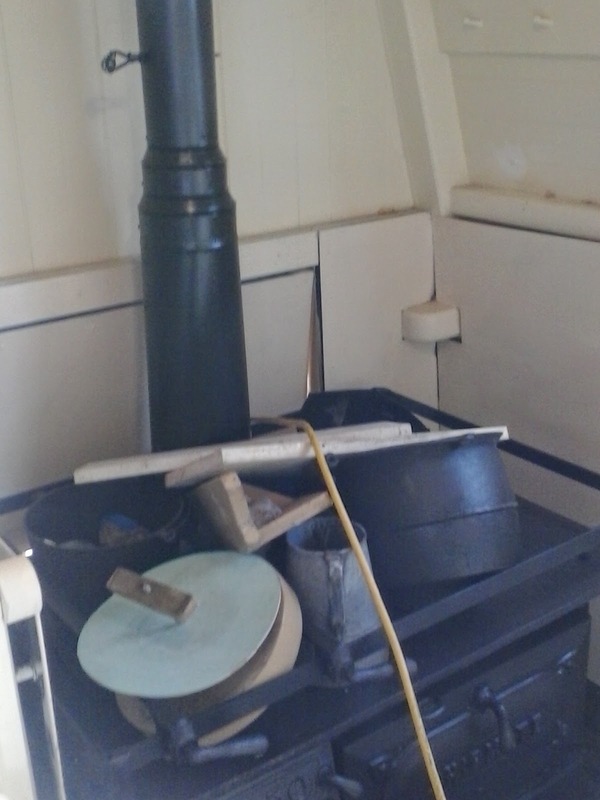 The small pantry forward on the Morgan's deck needs to be cleaned up before it can be used. Getting ready for her first 'outing' in 73 years (when she arrived to Mystic). 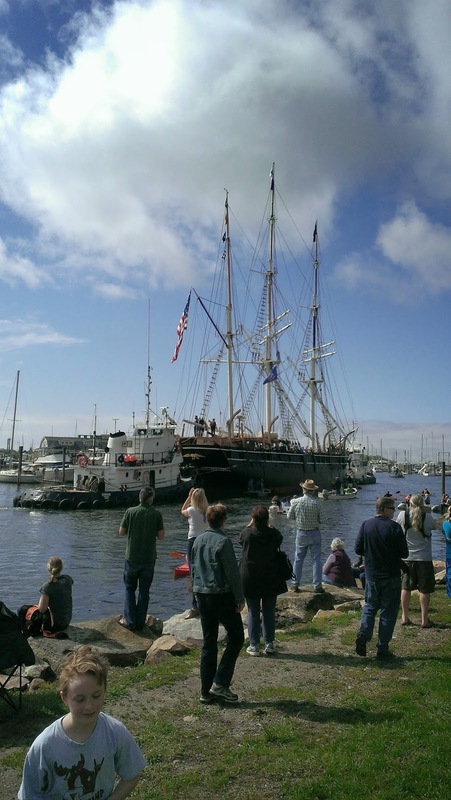 Last time the Morgan sailed was in 1921, her 37th voyage as a whaleship. As a matter of fact, she did 'sail' a couple of times after that, when she was a 'star' in some silent motion pictures during the 1920s, among them Down to the Sea in Ships (1922). Watch the movie here. The Morgan has started her 38th Voyage, getting close to the famous drawbridge in Downtown Mystic. The lower yards are tilted to be able to let her go through the bridge. Some of the whale boats escorting the Morgan downriver. Farewell - see you back in Mystic in August! Read more about the Morgan and Mystic Seaport in these issues of the Mystic Seaport Magazine. *A 'Lucky Ship' had the reputation of having survived storms, ice storms, fire, and other situations that were dire for a vessel. Boys at Eton’s ‘4th June’ in with their decorated boaters prepare for the 2011 Procession of Boats. Henley 2013. Straw Hat Day marks 47 days until Henley 2014. With University of Washington winning the Olympic eights at the 1936 Berlin Games - so beautifully told by Daniel James Brown in The Boys in the Boat - when it was time to prepare for the 1940 Olympic Games, which were going to be held in Tokyo, the Huskies' coach Al Ulbrickson (above) was ready to fight to represent the USA in the eights again. Below is a 1939 film showing him 'inspecting' his oarsmen before they go out for practice, according to the voice on the newsreel, for the coming Olympics. As we know, the 1940 Games were relocated to Helsinki due to the War, but soon the Finnish capital had to be given up, too, as Finland was attacked by the Soviet Union in 1939. The 1944 Olympic Games in London were thereafter cancelled.